Originally called the Yonder Cowleaze on Philip Byles map of 1653, Lower Cowleaze formed the eastern end of the northern side of a steep-sided valley through which ran Lyde Brook, the southern boundary of Great Lyde Farm. 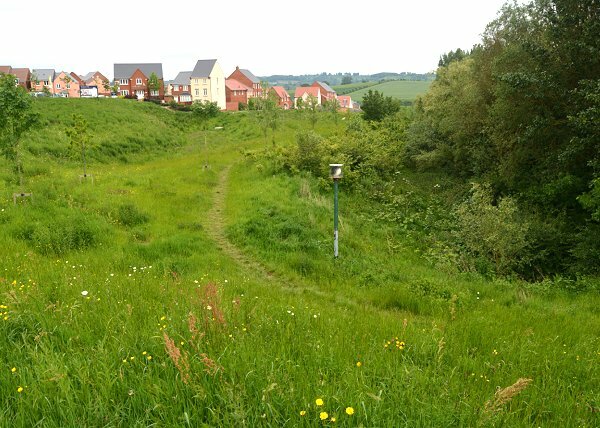 A remnant of the steep valley profile may still be seen in the northern part of Lower Cowleaze (907) however in the late 1960s and 1970s the valley was used as a landfill waste site. When the valley was all but filled, earth was brought in to level this and the adjoining fields - forming the flat field surface we see today. Since it is made up ground it cannot have housing built on it and will remain a green (technically brown) site since there is a danger of gas build-up from the rotting waste below. A walk along the path to the River Yeo will show several vent pipes. 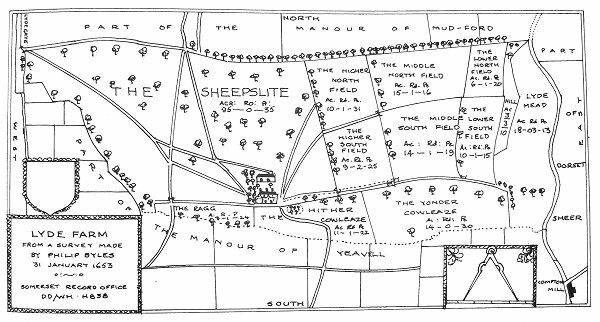 The 1842 Tithe Map showed that Lower Cowleaze was bounded on its south by the Lyde Brook, to the west by Great Home Close (903) to the east by Great Mead (893) and to the north by three fields; Lower Eight Acres (904), Higher Cowleaze (905) and Nine Acres (906). A small section in its southeastern corner was partitioned off as Spear Bed (908). The 1846 Tithe Award noted that Lower Cowleaze was 14a 1r 20p in area and used as pasture for grazing livestock and, indeed, the name 'cowleaze' simply means pasture land on which cows were grazed. 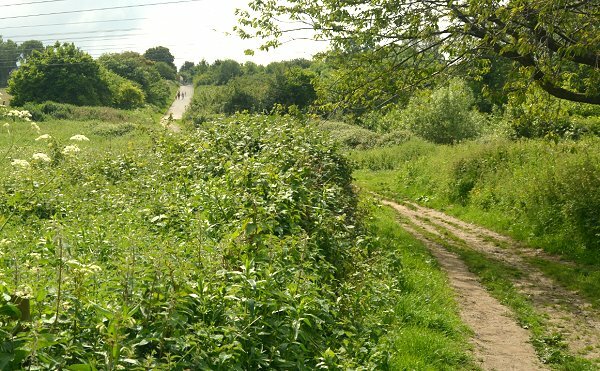 Today Lower Cowleaze is the northern part of the field, east of the Lyde Road / Great Mead roundabout, but starting about a third the way towards the River Yeo and is now just an open space mainly used by dog walkers. Philip Byles map of Lyde Farm dated 31 January 1653. Lower Cowleaze is shown as 'Yonder Cowleaze' at bottom right. 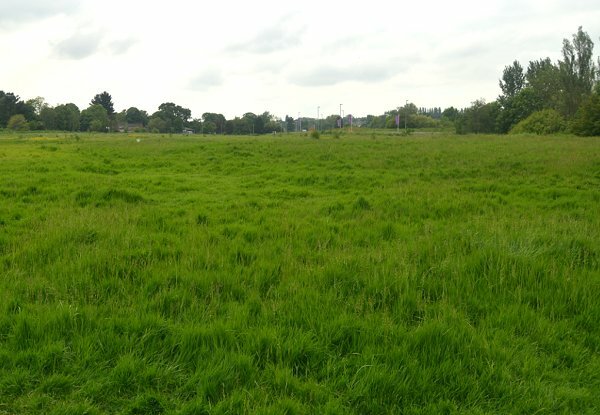 The same area today 'borrowed' from Google maps and taken around 2010 when the groundworks for Wyndham Park were being started. This is some twenty years after Great Home Close and Lower Cowleaze had been used as a waste disposal site and the valley leveled off. Lower Cowleaze seen from its eastern end and looking west. The streetlights seen right of centre are those of Great Mead and are in the northwest corner of what would have been Lower Cowleaze. Photographed in 2014. This is along the northeastern corner of Lower Cowleaze looking towards the new housing of Wyndham Park - the section shown here were built in the former Higher Cowleaze (905). 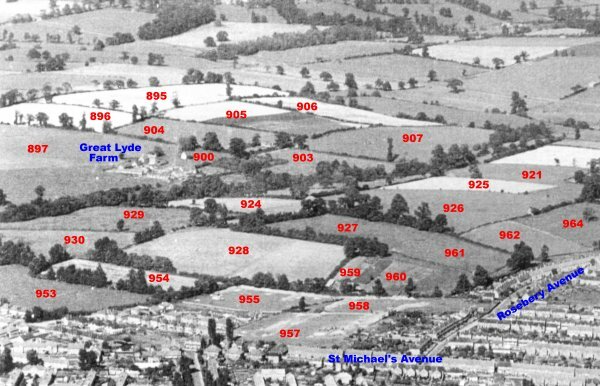 Note the steep sides of the valley that originally reached as far as Long Orchard (899) in the west. This is the only remaining part of the valley that wasn't used as landfill. Note the green post at centre - this is a vent to allow any potential gas build-up from the landfill to escape. Photographed in 2014. This photograph was taken from close to the Rive Yeo and looking west. The hill seen in the distance with people walking up the track is chiefly made-up ground after the valley was used as landfill. At the top of the hill (which wasn't originally there), to the right, is the southeastern corner of Lower Cowleaze which would have naturally been closer to the elevation where I stood to take this photograph. Photographed in 2014.